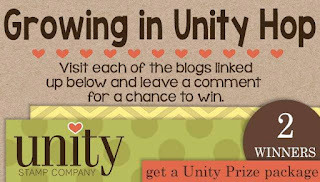 I am so excited to be a part of the Growing in Unity Blog Hop! I am just as eager as you are to hop the blogs of my fellow GIU's! I know that I am not alone when I say how thankful I am to have found Unity Stamp Co. The quality of their stamps are unmatched, and the wide range of selection meets the taste of every stamper. I had the best time yesterday creating the two cards I am featuring today. Dawn inspired me to make my first Christmas card of the year! I typically make more of a simple card that I can easily duplicate. Unless I am making a Christmas card for my dearest friends and family. This one is for a niece that I just adore. I know she will love Aubree Girl as much as I loved coloring her! Most of the cards I create using Angie Girls are made with this similar design. I can't seem to get away from it. I just love it so much! Images aren't near as clear on the blog as they are on my social media accounts. Links to my IG and FB can be found under my blog name description. I would love for you to visit me there! Here are the details of creating the Aubree Girl card. The card is an A2 cut vertically. (4 1/4 x 5 1/2) My go to and favorite size. The beautiful background paper is from a 4x6 Paper Studio pack called Old World Winter. (I have it in 12x12 too :) I cut just enough to hid the end behind Aubree. I stamped her on a piece of Canson XL watercolor paper and colored her with my Altenew watercolors. I added Sprinkled Sugar Stickles to her waistband, shoes and the top & fluff ball of her hat. It gives wonderful dimension and such a pretty sparkle! After she was completely dry I ran her through my Gemini to cut the border. I think I bought the border die from Lawn Fawn a few years ago. This was before I started keeping all the packing my supplies come in. Lesson learned! I always love the look of adding washi to a corner. And that snowflake! I love it! I keep a nice collection of wooden and metal charms that I buy in small bulk from Amazon. I just love adding them to most of my creations! 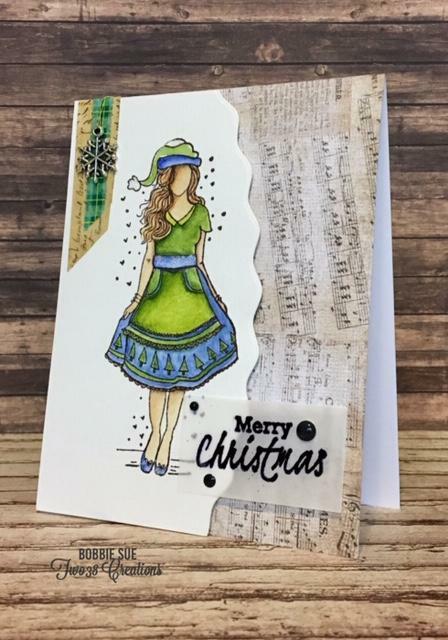 The sentiment is from Graciellie Designs "Cheery Christmas". I heat embossed it onto a piece of vellum. I wish I had cut the vellum to fit the entire length of the card. I really like that look when using vellum. This next card I made as a thank you card to give our daughters in-laws. My husband and I are traveling to our farmhouse in Arkansas next week and they will be having us to their home for Thanksgiving dinner. I absolutely adore this cup and pumpkin! Here are the details of creating the thank you card. This is also an A2 vertical size card base. The background paper is from the same paper pack Aubree card was. I tend to pop up the front panel of most of my cards. I love the look and dimension it gives. The cup is called "Pumpkin Spice" and the Pumpkin is "Bountiful Fall". I stamped the cup first then masked it so I could slightly hide just a bit of the pumpkin behind it. I stamped the pumpkin up and back a bit to give the appearance it was sitting on the table behind the cup. I water colored the images with my Altenew watercolors. I simply sketched out the "table top" with the tip of my watercolor brush. I love the look of layering 2 different sized ribbons. The brown one I found at the Dollar Store and the jute one is from Unity. The sentiment is from the September 2017 Sentiment Kit called "Abundant Blessings". It is one of my absolute favorite sentiments. The coffee cup called Fall to Go also has this sentiment just in different fonts. I love them both! I cut the sentiment out with a deckled die set from Spellbinders. I always forget I have this die set! I really do like it. 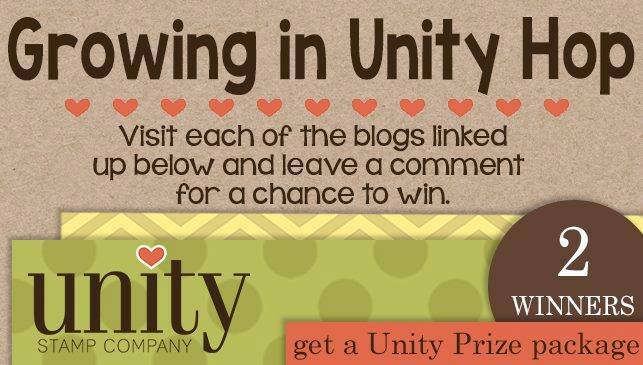 Here are the details for following the hop and having the chance to win some wonderful Unity Stamps to add to your collection! 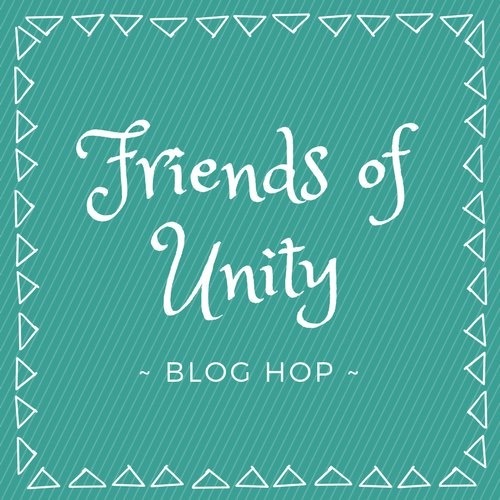 I am the last blog on the hop, friends! I hope you have had a chance to visit each one. I know they are all equally as wonderful and unique! If you've not been to each one, please see the blog hop list at the bottom of this post and prepare to be inspired! Be sure to go back, visit and leave a comment for any you may have missed! Thank you so much, Patricia! I typically use traditional Christmas colors, but this year I wanted to change it up. I love the result! Amazing work on both of your cards. Your watercoloring is amazing!!! I especially love the girl and your color choice. Your daughter-in-law is going to be so proud to receive your Thanksgiving card! Thank you so very much, Kathryn! So appreciate your comment! Love this girl! Your choice of colors and the shading is gorgeous! I need to practice the shading when I color, the dimensions that are added truly take cards up a level. Thanks for the inspiration! Thank you, Ginger! I’m still learning shading, but yes it adds such great dimension to the image! You are always so generous with your comments, Stacy! Thank you!! I only make a few Thanksgiving cards, but now that I have more fall themed stamps I’ll make more. They truly are wonderful to give!! Love both your cards! Love the girl, that sheet music background is gorgeous! Thank you! Isn’t it so pretty! I was so glad I came across that! Renee, thank you so much! What a lovely comment. I like both of the cards a lot, but the Angie girl stole my heart! Thank you, Linda! She stole mine, too!! I love an Angie girl! Happy Thanksgiving! Of course both of your cards are fantastic! But, your coffee/pumpkin card is my favorite of the two... so creative!! I have both stamps, and never to combine them!! Thanks for inspiring me, my friend!!! So so kind!!! Thank you so much, my friend! I appreciate your comments so much, Alyson! Thank you so much, Shannon! I just love those Angie girls so much. I LOVE both of your cards!! Autumn is my favorite season, and I love everything about your special Christmas card!! Wonderful cards - both so special! Your cards and write ups always put a big smile on my face! 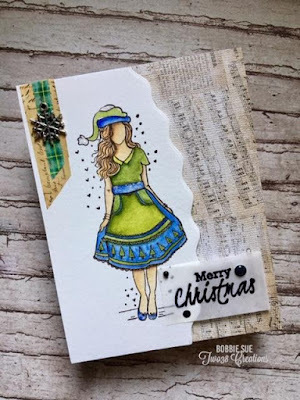 I love your edge die that you use with Angie girls- it is such a pretty look! And, the pretty DP that shows is so pretty too! Your watercoloring is lovely as well! I also put many dies in magnetic plastic boxes and threw out the outer packages- if they are purple- Chreery Lynn, Blue- MaryAnn. silver...good & lucky Guess! 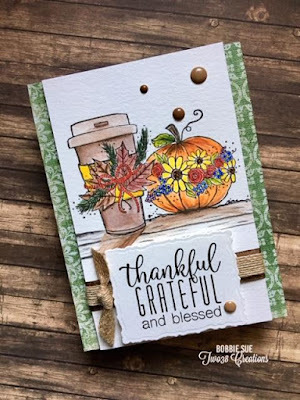 I adore your masked coffee cup & pumpkin card- so very festive! Have a safe trip and a wonderful Thanksgiving!!! Oh my so so kind of you!! Thank you so much for your words, Shelly! You have a wonderful and blessed Thanksgiving! 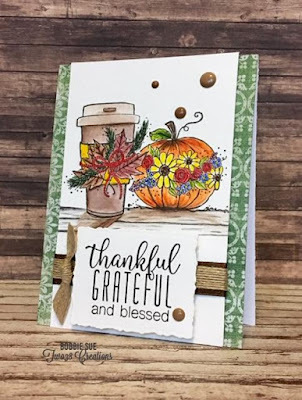 Beautiful card, your water coloring is just awesome!The cup and pumpkin is one of my favorites,it makes me think Fall and all the beautiful colors! I hope you have a wonderful Thanksgiving with your family! Buffy, thank you so much for this! You have a wonderful Thanksgiving! Just stunning. Your coloring is amazing, love those stamps together, and great designs. Just wonderful cards. Bobbie Sue, these card are SO very FABULOUS. I adore your creative style, it is so elegant. Thank you so very much, my friend! Your comment means so much to me! Love the card and the colors are so bright and cheerful! thanks for sharing your talents with others. Stunning! I love your design layouts and your choice of colors!! Beautiful cards!!! Love the Christmas card, your coloring is amazing!! What beautiful cards and of course family get the special ones. I like using that pumpkin and cup together, it looks like they were made for each other. Both cards are just delightful! Love all the details on the Christmas one. Great colors on the Grateful one! WOW! Both of your cards are gorgeous! Very nice.. love them both!! Oh, wow! Both of your cards are wonderful (as usual). I love the design of your Angie girl cards, too. Your cards are great. It is so interesting to see everyone's take on different stamps. Thanks! I always love all of the layers you creatively assemble with your cards. This speaks to me as I typically use layers myself. Safe travels to you this week! Why mess with such a lovely design?! Your first card is really beautiful. And Aubree is one of my faves (one of many! haha). I love any type of a script BG whether it be musical or otherwise. It's such a pretty look. And your 2nd card is just as lovely, too. I have both those sets; they're awesome! Of course, you had me at coffee... lol Have a lovely Thanksgiving! great cards!! Love the variety. Very pretty cards! I really like the different layering of the different patterns of paper etc... Very lovely looking! I love both cards. My favorite is the one with the coffee cup and pumpkin. It is so bright and cheerful and the detail is awesome. I love your coloring on the cards. Absolutely gorgeous cards, I love the first one, feeling very inspired by it, thank you! The first card is absolutely georgeous! Never thought of cutting edge after coloring. I always did it before stamping. So thank you for the idea! I enjoy seeing the use of stamps as I am not very creative. I love how you paired the coffee and the pumpkin together. Your cards are always amazing without fail! Gorgeous, fabulous and stunning! Wow! Your cards are so beautiful! The water coloring on Aubree Girl is amazing!! Great design and colors! And your Fall themed thank you card is perfect! 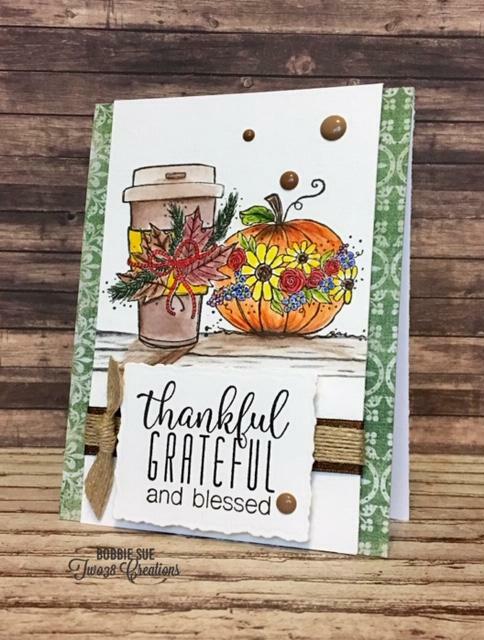 I love that you paired the Fall cup with the pumpkin! Perfection! Beautiful cards!! Thanks for such lovely inspiration! Love your cards, Bobbie Sue! So artfully put together!